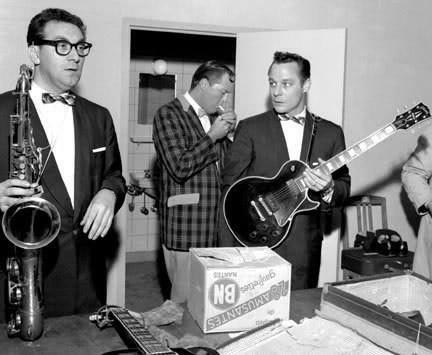 Franny Beecher, lead guitarist for Bill Haley and the Comets, which helped kick off the rock and roll era with the hit “Rock Around the Clock” in 1955, has died. He was 92. Beecher died in his sleep Monday night at a nursing home near Philadelphia, daughter Pauline Grinstead said Tuesday. The Comets, whose hits also included “See You Later, Alligator,” are credited by some music historians with having recorded the first rock and roll song in 1953 with “Crazy Man, Crazy,” the group’s biography on the Rock and Roll Hall of Fame website says. Beecher, born Francis Beecher in 1921 in Norristown, started playing guitar before crowds when he was 17 and continued until he was 90. Before the Comets, he performed with Buddy Greco and Benny Goodman, Grinstead said. Although Philadelphia session musician Danny Cedrone played on the original recording of “Rock Around the Clock” before his death in 1954, Beecher played the signature song for the first time on national television in 1955 and also played with the group in films. The Comets broke up in 1962, but in the 1980s, Beecher and some of the original members reunited and played tour dates around the United States and internationally for years. Grinstead said her father also is survived by two sons and six grandchildren. Here are some you tube videos I thought you may like. Some great footage for you. Big loss but he lived a long and fun life and what a great guitar player. This entry was posted in Blog and tagged bill haley, Franny Beecher, rock n roll, rockabilly, Sun records. I remember these days so well.